Prospects for the local business scene look promising at the Port of Tvøroyri as new investments in the expanding fishing industry match harbor infrastructure development — with cruise tourism meanwhile slowly entering the picture, too. Things move fast nowadays at Tvøroyri. 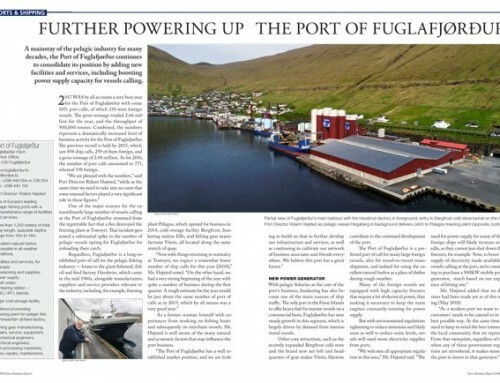 Less than four years after the opening of the Varðin Pelagic fish processing plant, overall economic activity has increased considerably, with unemployment virtually gone and a new sense of optimism present throughout the community. 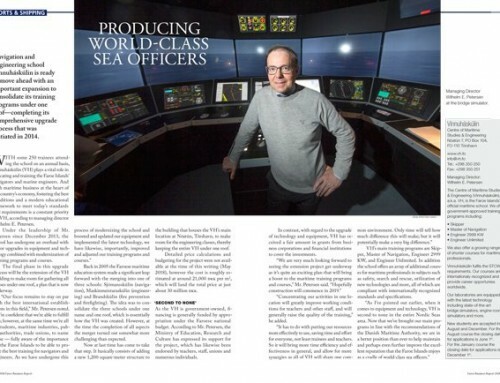 Yet the unmistakable boost to the local economy coming from the fishing industry is only the beginning of a longer upturn, as per the assessment of Port Director Jón Bogi Guttesen—the Port of Tvøroyri is ready to receive a growing influx of bulk reefers and container vessels and, to some extent, cruise liners as well. 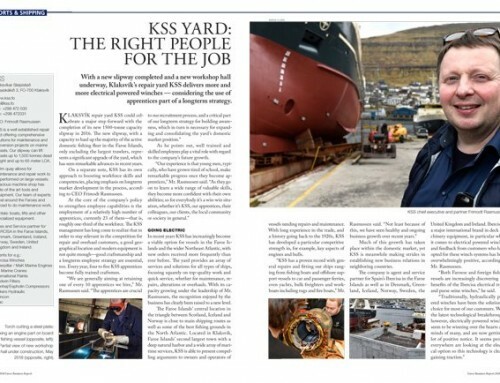 That is, of course, in addition to the growing number of ship calls from fishing vessels, including, amongst others, Varðin’s impressive fleet of pelagic vessels and locally based whitefish trawlers. The Port has developed its capacity to receive and handle vessels of such size as are only rarely if ever seen calling at the port, Mr. Guttesen noted. A few months ago, Varðin Pelagic announced their plan to build a surimi factory at the premises next door, previously occupied by the local Fish Landing Station. The new facility is expected to be fully operational before the end of the year (2016) and represents a significant upgrade of Varðin Pelagic’s commitments in the industry. As for whitefish, in the same neighborhood at the Fishing Harbour, processor Delta Seafood are currently expanding to consolidate their operations under one roof. 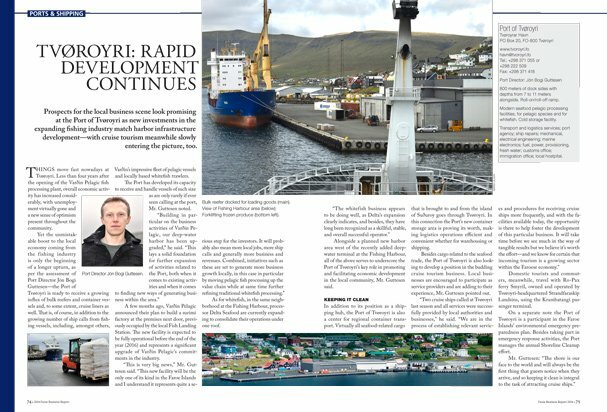 Alongside a planned new harbor area west of the recently added deepwater terminal at the Fishing Harbour, all of the above serves to underscore the Port of Tvøroyri’s key role in promoting and facilitating economic development in the local community, Mr. Guttesen said. In addition to its position as a shipping hub, the Port of Tvøroyri is also a center for regional container transport. Virtually all seafood-related cargo that is brought to and from the island of Suðuroy goes through Tvøroyri. 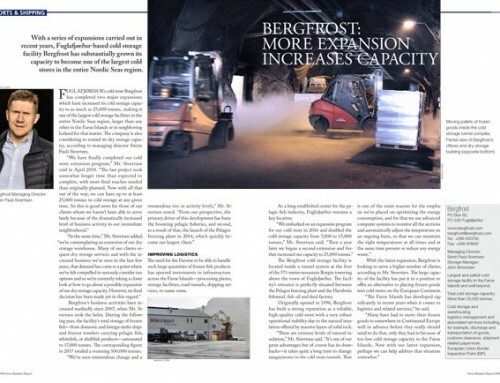 In this connection the Port’s new container storage area is proving its worth, making logistics operations efficient and convenient whether for warehousing or shipping. Besides cargo related to the seafood trade, the Port of Tvøroyri is also looking to develop a position in the budding cruise tourism business. Local businesses are encouraged to participate as service providers and are adding to their experience, Mr. Guttesen pointed out. Domestic tourists and commuters, meanwhile, travel with Ro-Pax ferry Smyril, owned and operated by Tvøroyri-headquartered Strandfaraskip Landsins, using the Krambatangi passenger terminal. 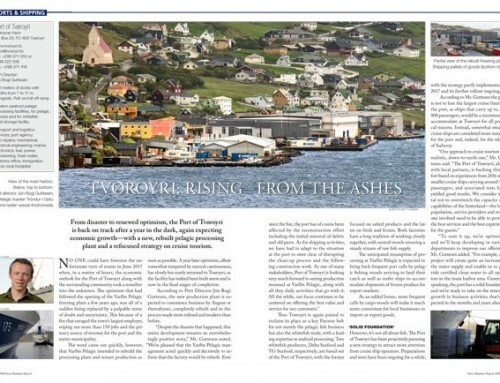 On a separate note the Port of Tvøroyri is a participant in the Faroe Islands’ environmental emergency preparedness plan. Besides taking part in emergency response activities, the Port manages the annual Shoreline Cleanup effort.